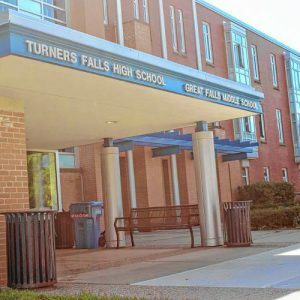 MONTAGUE – With a unanimous vote from the Gill Montague Regional School Committee, the caps and gowns for Turners Falls High School’s graduating seniors will be blue across the board. The decision was prompted by an appeal by the high school’s chapter of the Bridges for Social Justice program to have one color for all students. But due to the abruptness of the decision, students will be allowed to choose between blue or white for this spring’s graduation. Heather Katsoulis, Mike Langknecht, Thomasina Hall, William Tomb and Jennifer Lively were the school committee members present for the vote Tuesday. Turners joins other schools in Franklin County with gender-neutral gowns, including Greenfield, Mohawk, Frontier, Mahar and Franklin County Technical School. Pioneer Regional High School allows students to choose between black or white gowns. Sophomore Mercedes Morales and junior Chantelle Monaghan of the Bridges for Social Justice program at the school came to the School Committee to propose that seniors wear blue gowns and white stoles. Morales said graduates should be able to celebrate without fear of being labeled a gender they may not identify with, and while allowing students to be able to choose, there is also concern about students being bullied for not conforming.